Photo info: Thought we could use something a little lighter after last week's image. 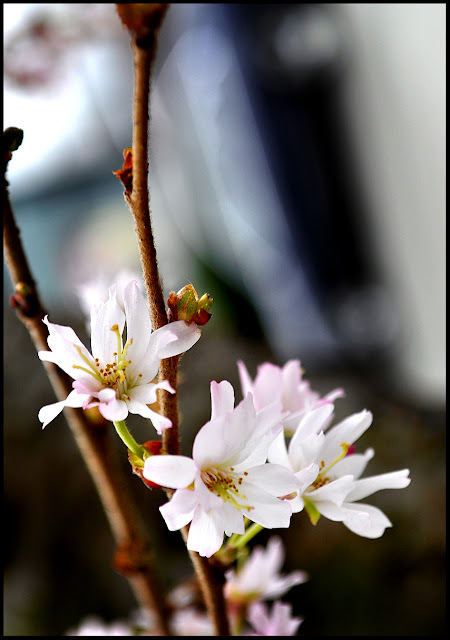 Took this one while in Seattle last week - cherry blossoms bringing a promise of spring. Yep - Perfect! Though we have a sneak peek already here :-) We're ready! Yes, absolutely perfect! Beautiful blossom, great photo and perfect quote to pair with the photo! Spring is just around the corner here. Gorgeous....both the image and the quote! I love that you and your daughter do this...but then, I have said that before. awwwwwwwww. loved last weeks.... but this is very lovey and like you said much lighter. Very Spring ! Nice job. I really enjoy Spring and am looking forward to everything in bloom. Although I'm not a huge fan of what follows Spring, and AZ summer. sooo pretty....off to email you now. I hope you will try the sauce recipe I posted today; it is delicious for a vegetarian meal! Bon Week-end! i love cherry blossoms... they are beautiful!!! Beautiful, as always. The quote is just perfect.